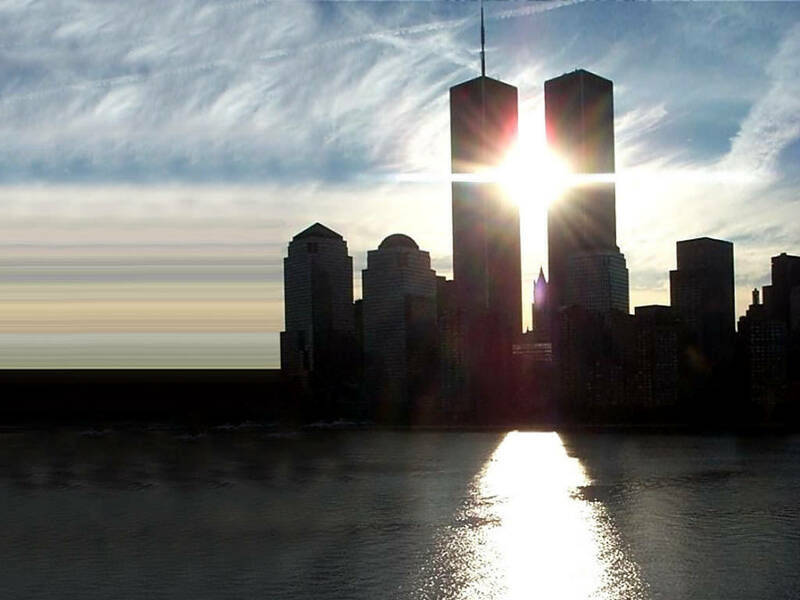 I think about it alone, mostly…those events of September 11th…but this year(2011) was different and I don’t know why. There are obvious reasons every year of course, but what was making this one so palpable and visceral? I rarely write, but periodically I post things on Facebook from a unique perspective of what happened September 12th and afterward. Some people get it. Some people don’t. I wrote “16 Acres” 9 years ago not only for me, but for other volunteers who helped in the recovery as well as for those interested in hearing about it. I’ve said before: We just don’t realize the most significant moments of our lives while they’re happening… That was surely a significant moment. 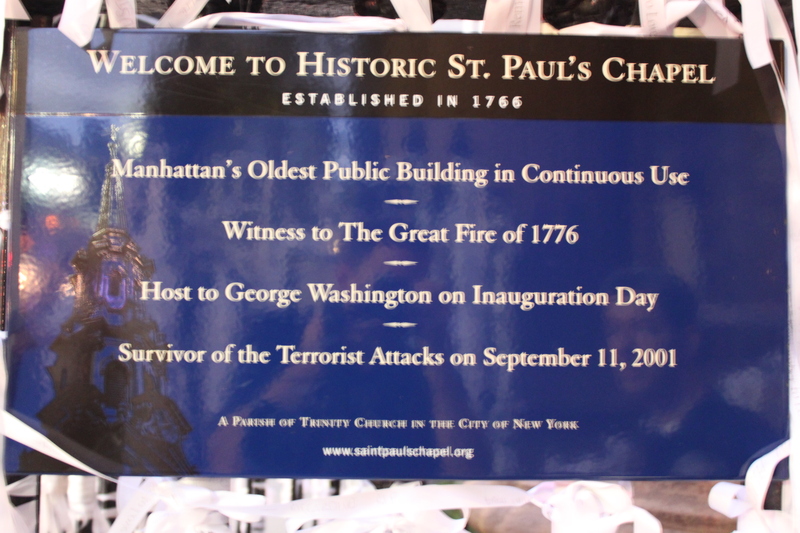 I never knew St Paul’s Chapel even existed prior to September 11th, but it’s history is incredible…the people who’ve visited it, the events the building has endured, as well as how I know it: As a survivor of the September 11th terrorist attacks. It lives in the footprints of the World Trade Center, and became a respite center for the crews working on the pit for 9 months. Ten years in the life of this Chapel is but a blink of its eye given it’s longevity, but something compels me and draws me to it. Extraordinary and amazing things happened there for me and I’m not alone. I have a health discipline that was welcomed there in those months afterward, yet my profession didn’t exist in the Chapel’s first 200 years. After all, I was supposed to go thru my life never knowing this Chapel existed. I went there on the one year anniversary of the attacks in 2002. I got that familiar feeling in the pit of my stomach again while driving down there – having not been there for 3 months. We (the volunteers) were there for the same reasons everyone else was, but also to see how the Chapel looked in its natural state, as well as to see each other in OUR OWN natural states…checking on each other…making sure everyone is “doing OK.” We all witnessed similar things while we were there, but when someone who helped out asked, “How ya doin’?”, you knew HOW they meant it and WHY they were asking. Usually the replies were a bit different from all the others who similarly or superficially inquired. After the volunteers, police and firemen saw each other at the Chapel that year, our group went to an Irish bar a few blocks away. There were two British police officers in full dress and we became instant friends that night. As the beers came, their appreciation was returned by offering up pieces of their garb: pins, collar brass, whistles, badges, “bobby” hats and batons. You name it and they freely gave it up. They left the bar drunk and virtually naked – but with an awesome memory of spending time with people who were REALLY here, as well as pins, pictures and reciprocated police and firefighter paraphernalia from our own New York compliment. 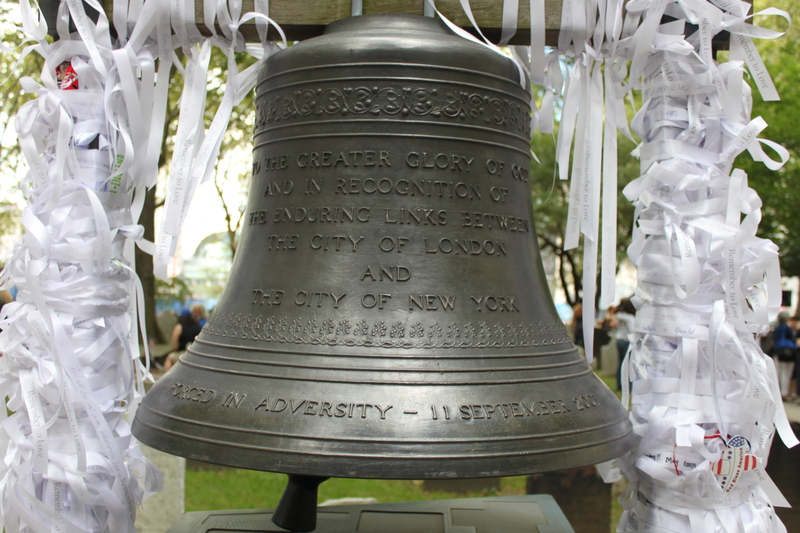 Later, we came to find out that those London police officers were there to deliver the “Bell of Hope” to St. Paul’s Chapel. We didn’t expect to meet them, but St. Paul’s has a natural tendency for extraordinary things. Over the years, life went on… things changed and other life events prohibited making that annual trip. I saw the gang on the 5 year anniversary in 2006, but I never went to the pit or the Chapel that year. We just met up for dinner in SOHO and caught up. 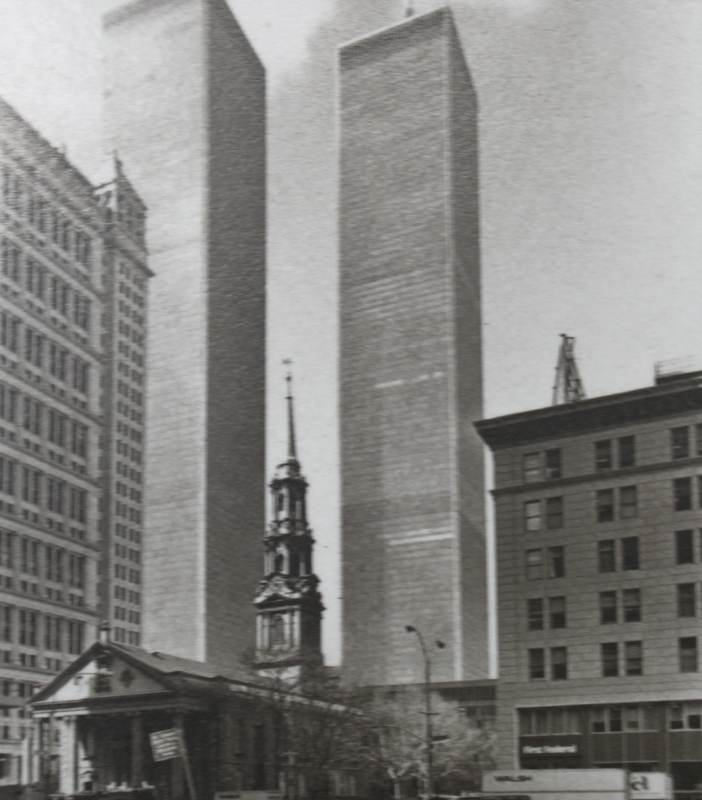 It dawned on me this year that I hadn’t been to Ground Zero or the Chapel since 2002. But this year, I knew I was going to go, and on the 10 year anniversary I still got that same unexplainable feeling in the pit of my stomach just like I did then. It’s like anxiety, but I knew I wasn’t going down there this time to work or volunteer…so what keeps making these trips so viscerally palpable? I coordinated with one massage therapist with whom I worked with every Tuesday night. Davy lived on the West side. He and I share a unique bond, a respect, a concern and an understanding few could fathom. For 8 months we were working partners, he the massage therapist and me the chiropractor. We held high respect for each others work yet I don’t recall either of us saying so, we just knew it. The working relationship we shared was complimented later with a friendship of equal caliber, and it was when we were in that Chapel that extraordinary things happened. From walking the pit, the Venetian blind story, to being taken onto the observation deck a week before it opened to the public (read “16 Acres”). From meeting the friends we currently know there to the closing ceremony of the Chapel as a respite center in May 2002 with it’s mysterious and cloudless rain, that Chapel holds a mystique and it simply impacts your life…forever! 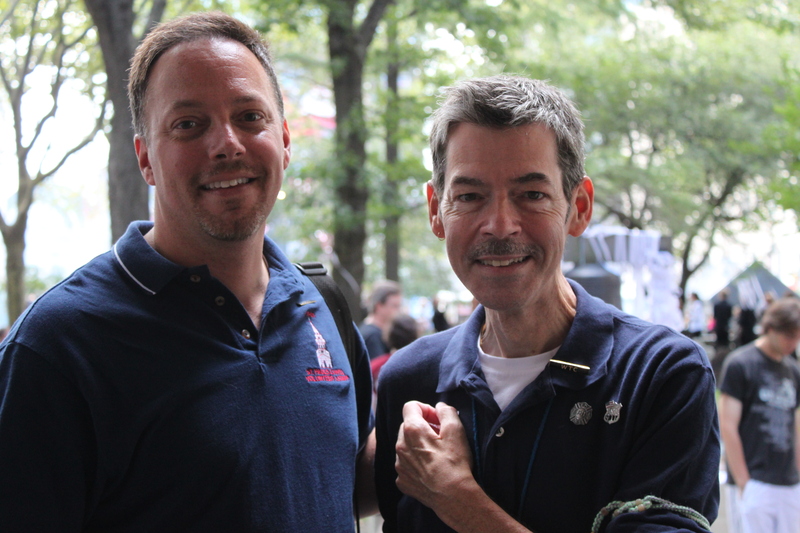 Feelings about the events of September 11th changed for me that instant. 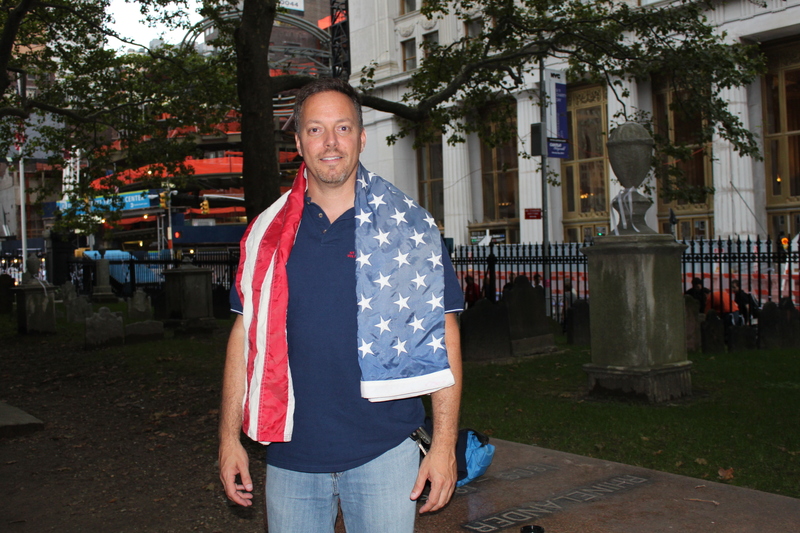 I felt a more personal closeness with how things have turned out with that flag on me. It took 10 years…give or take a day, but it changed…and it changed for the better. Previously I’d not found a place or thing that gives me the feeling St. Paul’s Chapel does, but it has never failed to deliver something…an awareness, an enlightenment or even a richness of comfort and emotion. However, this time, it delivered something and someone: a symbol of gratitude, accomplishment and recognition. 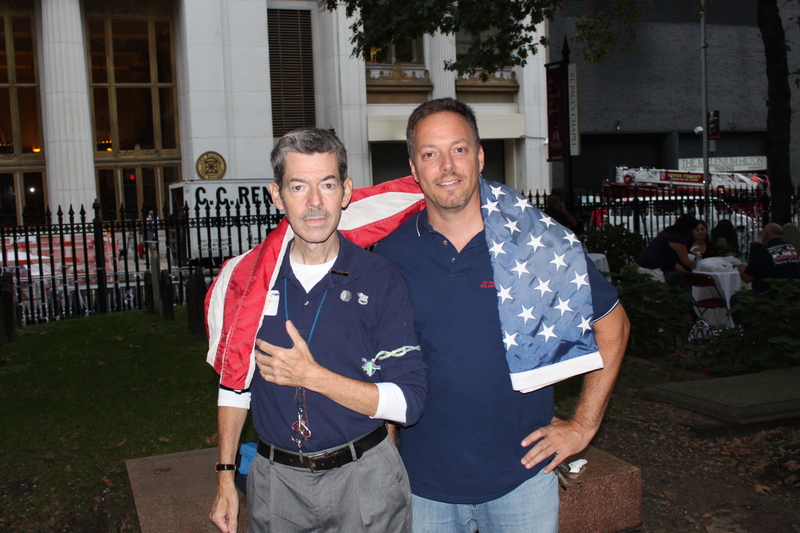 A simple gesture that said “Thank You and Farewell” in the form of a veteran and a very special American flag. And I realized something else down there yesterday. That feeling in my stomach while driving down to St. Paul’s each time…? Well, it wasn’t ‘anxiety’. That Chapel is a place of human selflessness, caring, compassion, courage, determination, freedom, loyalty, concern, light and love in it’s purest forms. That was what I was feeling. I knew I was driving to a place where those human qualities thrived. It took 10 years to figure out that those weren’t “butterflies” or chills of nervousness. It was knowing I was approaching absolute humanity in all it’s wonderful forms and allowing it to course through my veins – as if the heavens opened up, reached out it’s arms, swept me in and allowed me to touch the face of God. that was absoluteley beautiful. thank you for sharing such an important, personal, and touching moment of your life. i know i’ll remember it for the rest of mine. Russ, my beautiful and well spoken nephew, I have read 16 acres but just now read your sequel. As I sit here in tears, as this is a difficult day for many personal reasons as well, I now realize how much this experience has impacted your life. You have truly grown and should be so fulfilled and proud of your selflessness. I know I am very proud of you and love you so much. Thank you for being you. That is absolutely beautiful. So well written. I have tears flowing down my face as I type this. There are so many unsung heroes out there. Thank you for sharing this with us. Thank you and the many volunteers for your help during our countries time of need. It is people like you that make the world a better place to be in. You are all heroes in my eyes. God Bless.